The 55PD9700 wears its size well, as a glossy Japan Black screen frame contrasts dramatically with platinum speakers down each side. What's more, Hitachi has put the TV on a powered, swivelling stand you can move around using the remote control. Unlike a fair number of king-sized screens, the 55PD9700 carries a built-in digital tuner. But getting the best out of the 55PD9700 needs hi-def material, and for supplying that you get two HDMIs and component video inputs. Other connections include a Secure Digital (SD) memory card reader, a PC VGA jack, and a USB port. Of particularly import is Picture Master HD: a new version of Hitachi's Picture Master system optimised for hi-def duties. Among Picture Master HD's jobs are digital image scaling; enhanced handling of motion, due to faster processing speeds; 12-bit colour processing; automatic optimisation of brightness and gamma settings; edge enhancement; and a new engine dedicated to the more accurate detection and processing of colours. Also significant is the 55PD9700's use of e-ALIS technology. e-ALIS plasma cells respond more accurately to the picture signal than standard plasma screens. Another big e-ALIS benefit is that it works progressively, rendering all the image lines simultaneously rather than in two passes. The 55PD9700's onscreen menus are attractively presented, and stuffed full of features - including options to switch on or off colour transient improvement, line transient improvement, luminance noise reduction, chroma noise reduction, and black level enhancement. While we admire the flexibility offered by making all these features available to the user, it makes the set less user-friendly than it could be. And it makes it easier for people without a technical knowledge to mess the picture up. When the 55PD9700's pictures are optimised to their best advantage they look very decent indeed. Colours are notably more natural in tone - during light and dark scenes alike - than those seen in the 55PD9700's rivals in this group test. We've arguably seen more sheer vibrancy, but we'll take the Hitachi's extended palette and colour blend finesse over aggressive colours any day. Building on the naturalism started by the colours is the picture's suppression of most noise, and some smooth motion handling. 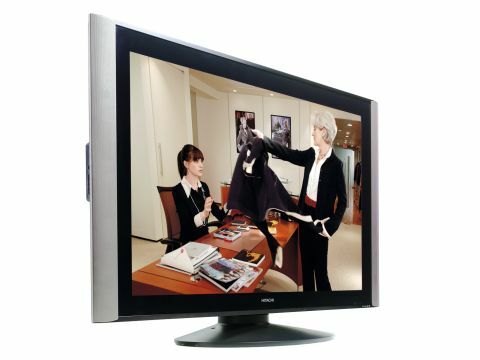 Standard-def pictures - like our Devil Wears Prada test DVD - survive the transition up to 55in better than we expected, providing a good indication of the quality of the Picture Master processing. The 55PD9700's black levels let its pictures down. Night scenes of New York looked slightly greyed over and short on background detail during our tests. We also noticed that horizontal motion during standard-def viewing can be afflicted by fizzing noise - a common plasma problem. The 55PD9700 employs no less than 10 speakers for audio duties - and these help deliver a huge and powerful soundstage. This matches the screen dimensions perfectly, and it's as at home with a full-tilt action movie as it is with the evening news. We can't help but like the 55PD9700. We've seen better pictures, but as a total package - sound, price and features - it gives impressive bang for your buck.